I am tired of all of the deals that everyone else gets with websites like Send The Trend, Beyond The Rack, Style Mint and the list goes on and on. When are the eco-conscious designers going to break out and give us a much less crunchy look! Our chance has finally arrived! 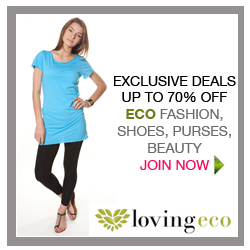 LovingEco offers daily private sales that help you make smart and fashionable choices. We all know the greenest choice is not to purchase at all but if you have to why let our environment suffer in the process. What I really like about LovingEco’s site isnt the sales at all but their team. You get to see their pictures and get a sense of who they are besides just forcing eco-fashionable sales on you. Not that that is what they do but many eco-businesses can write an excellent mission statement and provide you with that you want to hear to increase their sales but the LovingEco team gets personal. You can feel if you are unsatisfied you know exactly who you can hold accountable and that takes courage! Did I also mention that proceeds go to charity when you purchase their Style for a Change tank. 100% of the proceeds go to one of 6 charities they have listed but you get to choose which one you want to donate to. That is a change I can definitely get behind. LovingEco’s Mission:Our mission is to create a healthier planet. We are passionate about inspiring change, giving back, having fun and making eco stylish. LovingEco helps give people the opportunity to make better choices about the products they purchase so that we together can create a more environmentally and socially conscious planet. By choosing to shop here you will create conscious positive choices from organic, recycled, eco-friendly and ethically produced items. And with each purchase a portion of sales goes back to charitable causes. Now start shopping differently…small changes can make a big difference. Have you ever tried LovingEco? If so what was your experience? I admit I haven’t purchased from them yet but I do plan on doing so! Keep in mind the holiday’s are coming and this is a great idea to get good deals on some great eco-conscious items. Yes, Yes I know another Ecoist item but what can I say, they have been wowing me more than ever lately. How cute is this scarf-necklace really! These absolutely fabulous scarf-necklaces are made from upcycled t-shirts and factory remnants and are handmade by local women. Ecoist offers a variety of prints but I personally can never say no to animal prints in general.Ecoist’sScarf-Necklace is moderately priced but that isn’t to say the necklace isn’t worth the purchase! I am completely swooning over these! Mother’s day is almost here and you know an important part of being a mother is keeping the peace in the home but does she get enough peace herself? Maybe not? Why not give her the gift of peace with the 7 Rings of Peace Earrings made by From War to Peace. These fantastically designed earrings drew inspiration from ancient times where 7 circlesmeant perfection as well as the 7 pointed star which stands to represent the peaceful union of all nations and faiths. How more peaceful can jewelry get right? The 7 circlesbronze earrings were recycled from bronze that was formerly disarmed nuclear missiles systems. I have written other articles about From War to Peace’s bracelets made from disarmed bullets. I love these items and I think your mother would too! They can be worn everyday but are elegant enough to be dressed up for a fancy evening out! I may not be a mother but I am definitely going to purchase a pair of these earrings for myself ASAP!